A cable assembly manufacturer has many options available that can help you stay in budget and get a custom cable that is right for your situation. Having an unlimited budget to work with when designing a custom cord might seem like the best way to get the perfect end product, but that type of situation is rare. In most cases, budget is a concern. The good news is your cable assembly manufacturer should be able to help you balance the cable’s functionality with cost. This may seem like common sense, but make sure you are sharing as much information with your cable assembly manufacturer as possible in the planning and design stages of your project. 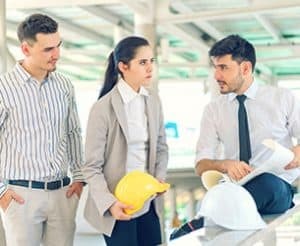 Having clear specifications about how and in what environment the finished product will function gives the design team a thorough understanding at the outset. This can translate to a cable assembly that meets the needs of the equipment and environment with fewer revisions or surprises late in the project. Armed with complete technical specifications and a good understanding of the environment where a finished cable assembly will function, the design team is able to select the optimum materials to create a solution that operates as expected. 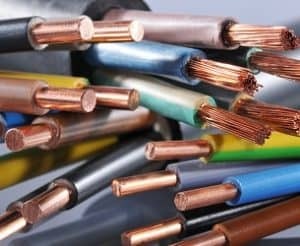 At its most basic, a cable is made up of a conductor, connectors, jacketing, and insulation. Each can offer an opportunity for cost savings with some careful thought. Obviously, the conductor material should be selected based on the type of signal and how long the cable is expected to be in use. However, with so many options when it comes to size, material, and plating, a cable assembly manufacturer can make recommendations that address cost concerns without compromising on functionality. For example: In many cases, a smaller conductor is less expensive. Choosing the smallest conductor that will transmit the signal or power allows you to get the functionality you need without the unnecessary expense of a larger conductor. Though, in some cases, a smaller conductor is actually more expensive to produce, so it’s doubly important to discuss options with your cable’s design team. All cable assemblies connect to some sort of equipment or power/signal source. Because the section of cable that leads to the connector is a common point of failure due to stresses, it’s important to select the right type of connector for the job. While an overmolded cable offers more durability in many cases, it may make more sense to use a connector that can be repaired by a technician. Understanding the needs of your finished product allows you and your cable assembly manufacturer to make the right decision before producing a cable that doesn’t fit your needs. The environment where a cable assembly will be used often dictates what type of jacketing material or insulation is used in the finished product. Different materials are more suitable for cables that are exposed to extreme heat or cold, moisture, or stresses. More expensive materials for jacketing aren’t automatically better for every environment. 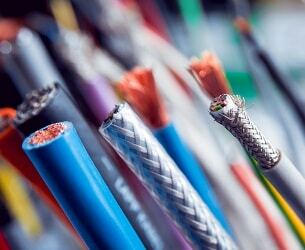 In many cases, choosing a more costly material that is unsuited for the environment can be a waste of money and compromise the function or service like of the cable. Good planning, open communication, and thoughtful selection of materials is the great way to save costs when creating a custom cable with a cable assembly manufacturer. If you are ready to talk about your next custom cable project, contact the team at Meridian Cable. We’d love to discuss your options. When designing custom cable assemblies for your product, it’s not always necessary to start from scratch. Custom cable assemblies are designed and extruded for products or equipment when an existing cable does not meet the needs of the application. While stock cable can be inexpensive and easy to source, it doesn’t make sense if it simply doesn’t do the job required or is not as durable as it needs to be to withstand environmental conditions. In many cases, custom cables are a great way to make sure all your needs and specifications are met. Low Durability – A stock cable that doesn’t quite offer the durability for your application is going to need to be replaced more often. A custom cable more suited to the requirements and environment would need to be replaced less frequently. Many Cables for One Piece of Equipment – One custom cable that meets all your needs is easier to install, maintain, and replace than multiple stock cables. More Cable than You Need – Using stock cables means you sometimes have to pay for a more expensive option than you actually need. A custom cable eliminates that need because it is designed to meet the specifications of your equipment. Creating a Cable from the Ground Up – There are circumstances when incorporating an off-the-shelf cable into a custom cable assembly saves time and money. Commissioning a custom cable doesn’t mean you have to start from scratch by designing a completely new cable. If a stock cable is nearly perfect for your application, it’s possible to make some changes with a design based on the existing cable. 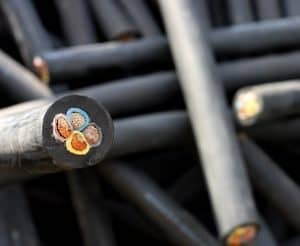 These changes could include adding a tougher jacketing material or reproducing the cable with more flexibility or a different gauge that is not currently available. Depending on the specifications of your product or equipment, you may need a custom cable assembly that combines multiple cables into one to save space. By combining these cables, the engineer can take advantage of different gauges and cable types – which may include stock cables – to create a streamlined solution that is tailored to your needs and specifications. Off-the-shelf cables can be a great choice if there’s an existing model that matches the specifications for your product or equipment that is able to hold up to the environment where it will be used. But if a stock cable doesn’t meet your needs or is only “close enough,” talking to a wire and cable manufacturer might be the logical next step. During your initial discussion, make sure you clearly communicate how the finished cable needs to perform. If you are currently using an existing cable, share any frustrations or limitations you are experiencing. This will allow the engineering team to gain a full understanding of whether incorporating an off-the-shelf cable into your custom cable design makes sense. An experienced manufacturer of custom cable assemblies, like Meridian Cable, can make recommendations that address any issues you are having with stock cables. They are also able to help you make the best choices when considering incorporating existing cables into your custom solution. Balance longevity, performance, and price with a custom cable assembly designed with the help of experienced engineers. Each custom cable assembly project comes with a unique set of requirements that calls for specific types of components for the best performance in a given situation. For example, a cable with the appropriate gauge for conducting electricity that is jacketed with a material that can’t withstand the environment will fail much sooner than it should even though it might meet requirements for price and performance. With the many options available for conductors, insulations, fillers, and jacketing, a thorough working knowledge of which components offer the appropriate results for a given set of requirements is key to manufacturing a custom cable assembly that meets your needs at an appropriate price point. That kind of knowledge comes from a strong background that includes engineering and manufacturing custom cable assembly solutions for a variety of applications in a wide range of industries. The gauge of a conductor impacts cost as well as how well electricity or signal flows through the wiring. An experienced engineer carefully considers how the cable will be used, as well as the voltage or signal type, and even the required length to determine the best gauge. While a larger gauge can reduce resistance and energy costs, a large gauge has a few drawbacks. The first of these is that larger gauges tend to be more expensive to produce. If your product does not require a larger gauge, you could end up paying more than necessary to produce your custom cable with no real additional benefits. While solid conductors can be inexpensive, stranded conductors offer additional flexibility to the finished cable. By working with stranding sizes that range from 0.002” to 0.023” in a variety of materials, an engineer is able to recommend options that offer the conductivity and flexibility that meet the requirements of your project. When we talk about insulation in a custom cable assembly, we are referring to a non-conductive material that is used to prevent energy leakage. 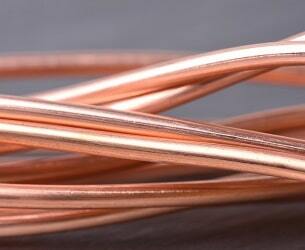 Insulation also helps protect the wire from heat and moisture. Insulations can be made from plastics, fluoropolymers, and rubbers. Understanding the characteristics of each of these insulating materials is vital to producing a finished product that functions in a safe and efficient fashion. 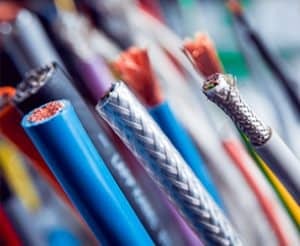 For example, some plastic insulations are inexpensive and have very good mechanical properties for many applications, but can emit a toxic halogens, making them inappropriate for use in some custom cable assemblies. Fillers – like cotton, nylon, kevlar, PVC, and fleece – are used to ensure optimum performance in a custom cable. They have a variety of uses in custom cable assembly design, including reducing heat and friction as well as helping the cable maintain its shape. Finally, choosing the appropriate wraps, shields, and jacket materials protects the conductors from interference, friction, and environmental conditions. The application, environment, and installation process can all be factors in what materials should be used to create your custom cable. There are a variety of plastics, rubbers, and fluoropolymers with differing resistance to heat, cold, moisture, and abrasion. With so many materials available, the knowledge and experience of your custom cable manufacturer can mean the difference between a well-performing cable at a reasonable price and an unnecessarily expensive or poorly performing product. Customized cable produced by a manufacturer specializing in prototyping and design can set your product apart. When looking for high quality, fairly priced materials for creating a prototype, it can be a challenge to find the right wiring components for your specific product and industry. There is no shortage of options when it comes to custom wiring and it can be a challenge to determine which material will be best for your product and wiring needs. By partnering with a manufacturer on Custom Cables for Prototyping, you and your team will have a knowledgeable resource to turn to when making these decisions. This can be the difference between a successful prototype and one that does not live up to expectations. Consulting with a manufacturer capable of extruding small amounts of specialized wiring to enhance and perfect a product is an important step in the manufacturing process. There are so many choices to be made regarding wiring systems that opting not to work with an engineer, instead of making assumptions about the best type of wiring to use, can be dangerous. To determine a product’s voltage, required wire gauge, and optimal heat rating engineers work with a series of calculations to ensure that they are producing a safe and effective product. If these calculations are not performed correctly or are overlooked, the resulting product could overheat, cause shorts, fires, or even injury. 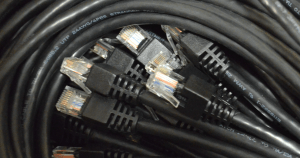 Cost is often seen as a barrier to working with a cable manufacturer. However, by working with an experienced cable manufacturing company, you can reduce the costs that are typically spent on experimenting with various products and wiring systems in an effort to determine which one will be most effective. Your manufacturer’s expertise and industry knowledge will guide you and your team to the systems that will be ideal for your product and its various functions. This will save time and the intensive research process that usually goes with choosing wiring materials without the guidance of an engineer. By utilizing custom materials, your product is likely to be streamlined and optimized for speedy manufacturing and assembly. This is beneficial if you intend to manufacture your product on a large scale, as much of the planning and manufacturing optimization will have been worked out previously. With a functional prototype of your project, you will be able to assess and make any modifications before it is produced on a large scale. This will cut costs while providing you with a highly customized wiring system designed for your specific product needs. Product testing is another important part of the manufacturing process, assuring that everything works as planned and is durable enough to withstand the product’s intended conditions. Manufacturers utilize a variety of testing methods to assess quality including: advanced life testing labs, pull testing, and measuring the consistency of the product’s voltage. Understanding areas that could be improved on are important to a product’s functionality and acceptance in the marketplace. Product testing is an invaluable step in. ensuring that your product works as planned and does not need further adjustments or alterations before being manufactured on a large scale. Working with a manufacturer is an important step in designing and producing custom wiring for a new product. 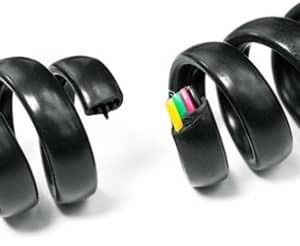 By working with a manufacturer, you have the ability to create unique wires and cables that are optimized to work seamlessly with your product. Don’t hesitate to reach out to the Meridian Team to learn more about the options that exist for your next wiring project.